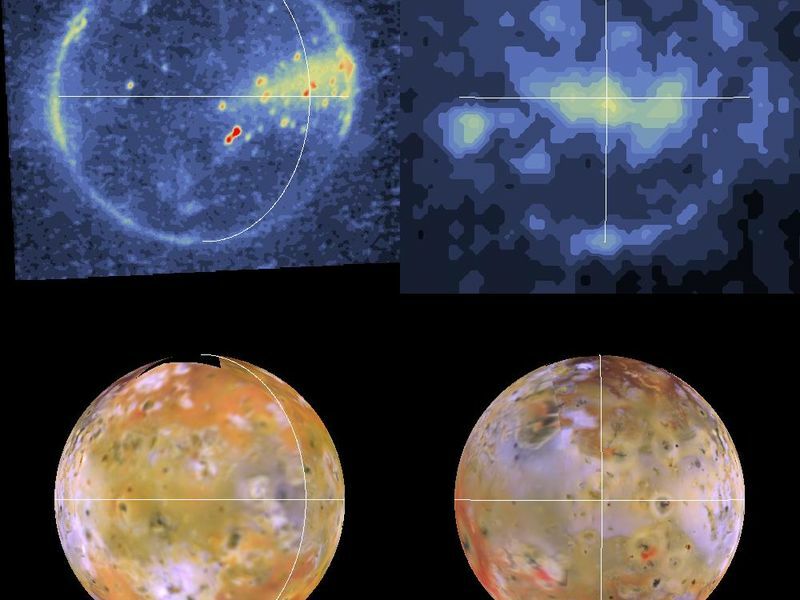 Shown here are color-coded images of Io in eclipse (top). The images were acquired by NASA's Galileo spacecraft during its tenth orbit around Jupiter. The corresponding views of Io in reflected light are shown at the bottom. The white lines delimit Io's equator and longitudes of 0 (left) and 180 degrees (right). Io always keeps the same hemisphere (longitude 0) facing Jupiter, just as the nearside of the Moon always faces Earth. Furthermore, Io is not a perfect sphere; it is elongated along the axis which is radial to Jupiter (the "a" axis). 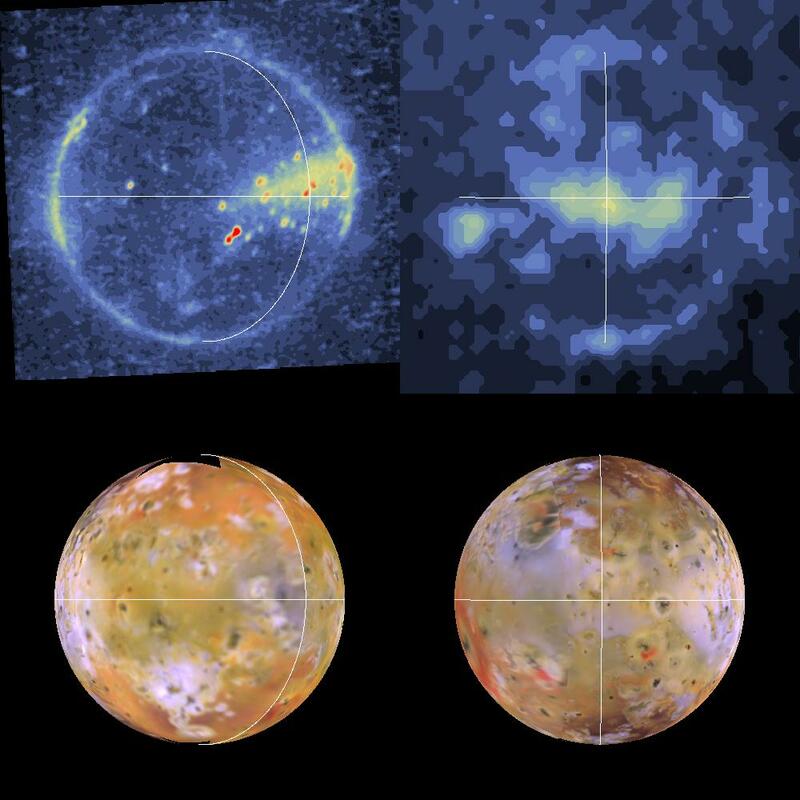 The solid-body tides on Io have the greatest amplitude (about 50 meters) where the a axis intersects the surface, at the sub-Jupiter point (latitude 0, longitude 0) and at the anti-Jupiter point (latitude 0, longitude 180 degrees). 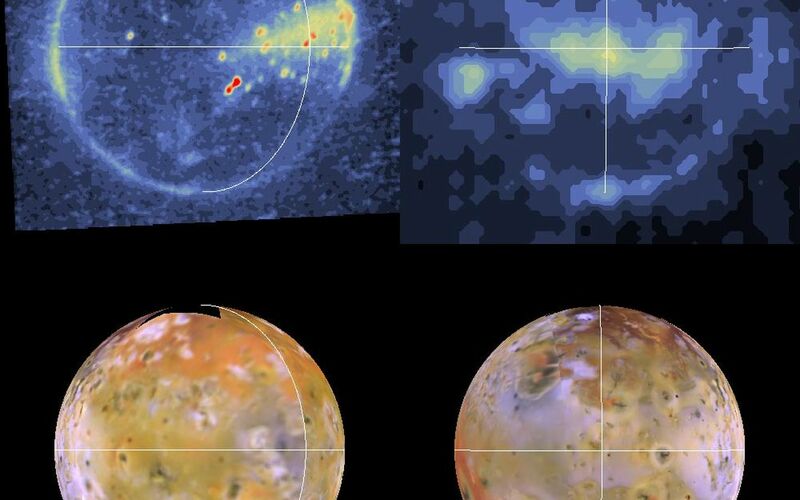 From these eclipse images we see evidence for enhanced concentrations of volcanic gases (dominantly SO2) at the sub- and anti-Jupiter regions. This enhanced degassing may be due directly to the tides or may be due to enhanced heat flow at depth below these regions. North is to the top of the picture. The eclipse resolutions are 13.2 (left) and 63 (right) kilometers per picture element. The images were taken on September 18, 1997 (left) and October 5, 1997 (right) by the Solid State Imaging (SSI) system on NASA's Galileo spacecraft.